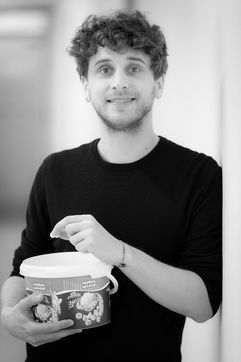 Benjamin Schaufler is co-founder of Zeitfenster (engl. Timeframe), a young start up that offers services of user experience design of digital products and that offers high-experiencing time traveling Apps for mobile devices through Stuttgart, Berlin and Nürtingen. Recently he finished his M.A. with major in remediation, transmedia storytelling and user experience design at the Stuttgart Media University. With his finished B. A. in information design studies in 2010, he has already acquired knowledge in the field of human-computer interaction, usability and information design. During his studies, he worked at Fraunhofer IPA, Media and Film Funding Baden-Württemberg and Alcatel-Lucent AG and gained experience in the field of Interaction Design, Web Design and Online Marketing. In 2013 Benjamin moved to Berlin and investing his skills as project manager and concept designer. Besides he worked at the 'T-Labs (Quality and Usability Laboratories) of TU Berlin on studies of visual food experiences. Mid 2014 he heading forward to concetualize and design a historical media guide for Weimar.